I’ve been surfing on the internet today, looking for interesting Artwork to write about. I found a link to a website on Netnarr’s Reading Roster. I clicked on the Museum of Digital Arts (MuDA) page, and I became utterly fascinated by the artworks! Especially the “Sounds with Pe Lang and Marianthi Papalexandri-Alexandri”. (May 31, 2018). I was mesmerized by the strange sounds, and suddenly my mind wandered off to a magical forest with frogs and other soundmaking birds and incects. Googled “Magical Forest” and found a suiting picture to top the feeling I got, listening to this peace. I love how digital Art inspires and stimulates the senses. I can watch art for hours and hours when I have the time and the right mood, and I find myself getting very inspired to make something myself! The only thing that stop me really, is mye lack of computer skills. I wanna learn how to be amazing with programs like for example Photoshop and simular tools to make art and digital literature, so I guess I better start learning myself to “rule them all!” Haha! Have a beautiful day in the SUN in Bergen! Yay! 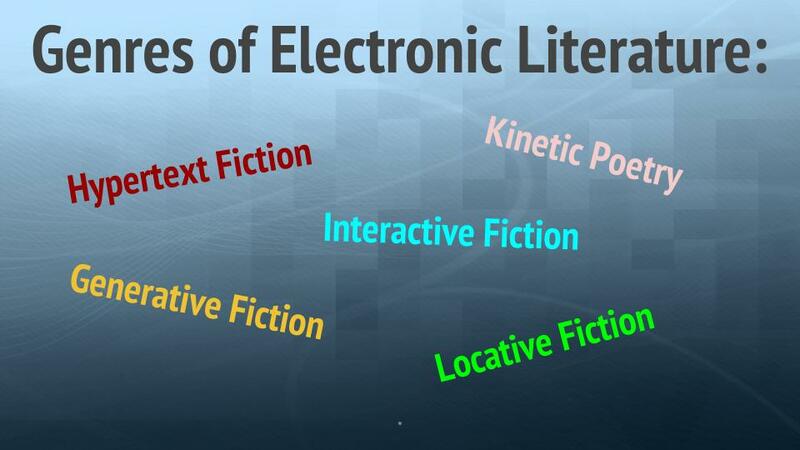 Today we learned that electronic literature is literary fiction and poetry created for the networks on the internet. An interesting thing is that the genres of electronic literature, while mainly focused on poetics, have connections to other forms of digital culture such as computer games and network art. Key words to remember here are for instance hypertext fiction, digital poetry, kinetic poetry, and interactive fiction. “Hypertext fiction is a genre of e-lit, characterized by the use of hypertext links that provide a new context for non-linearity in literature and reader interaction”. It was so interesting to take part in the stories we were showned in class, and so muh fun to click on the different links in the story and be able to participate and choose the next move to continue the story. We chose links to move from one node of text to the next, and in this fashion arranges a story from a deeper pool of potential stories. “Interactive fiction is software simulating environments in which players use text commands to control characters and influence the environment”. Electronic literature makes the poem, story or the message easier to remember, since you are taking part in it, and it’s a great platform for artists and writers to show off their work. Digital poetry. I found a website that explained this genre in a pretty good way. Instead of rewriting it, I’m gonna put the link here for you to see. Enjoy the weekend everybody!